Book: Fallen in Love "A Fallen Novel In Stories"
And in a twist of fate, four extraordinary love stories intersect over the course of a romantic Valentine's Day in medieval England. Miles and Shelby find love where they least expect it. Roland learns a painful lesson about finding and losing love. Arriane pays the price for a love so fierce it burns. And for the first-and last-time, Daniel and Luce spend a night together like no other. Lauren Kate's Fallen in Love is filled with love stories...the ones everyone has been waiting for. Fallen in Love is a Fallen novella-sort addition to the series. It is by #1 New York Times Bestselling Author Lauren Kate, and was released earlier this week on January 24, 2012. Initially when I heard about this release I was very excited- I'm a huge fan of Luce and Daniel's love story and I find myself shaking with anticipation every time I have a new book in my hands. The book takes place sometime before the end of Passion when Luce was travelling through Announcers. The stories are kind of like pit stops the characters are thrown into as their searching for Luce. This book does not focus just on Luce in Daniel. Actually, you don't read about their story until the very end. But because of this, we really get to read more depth on other characters of the series that we hadn't known as much about before. All of their stories showed their own battles with love, which really gives you an insight on the emotions these characters hold with them everyday. I particularly loved seeing the blossoming romance between Miles and Shelby. It was my favorite "book" in the novella because it was so sweet and refreshing. I'm really looking forward to seeing how their relationship changes in Rapture. Roland's story was also very good- but heartbreaking. I really felt for him when he was remembering the memories he had of his true love....poor Roland. *wipes tear* Reading his history gave me this new love to his character. What I was really anticipating with Fallen In Love was Luce and Daniel's story. From the synopsis, I was kind of thinking that Luce and Daniel would have that special night together.....wink wink, nudge nudge ;) But did this happen?! Spoiler alert- NO IT DID NOT! Even with my, probably unrealistic expectation, I found their story kind of blahh. Really, their story was just another moment from their past lives. Although there are a few cute moments between the two, it didn't make me giggle or grin in excitement. I'm looking forward to returning to modern-day Luce and Daniel after reading about all of their past lives not only in Fallen In Love but Passion as well. 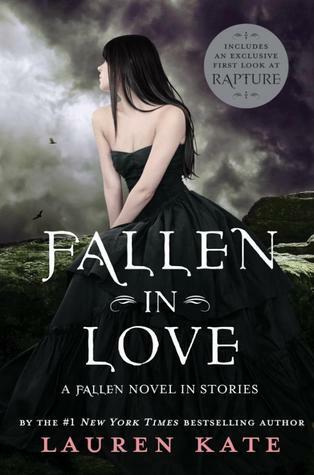 I have to say, all the covers for the Fallen novels are some of my ultimate favorites- and Fallen In Love's cover did not disappoint. Not only does it stick along with the gloomy theme and focus on Luce- but a new addition was added to this book. While looking at the back of the cover jacket, I noticed a small piece of text telling me to get the free FALLEN app from Apple App Store or Android App Market and point my camera to the book. So, intrigued as I was, I immediately got my IPad and downloaded the app. My mid was completely blown away! 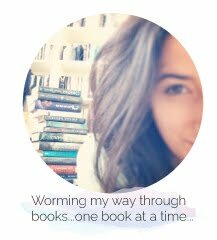 When opening the app and pointing the camera to the book, the sky in the background started to thunder and birds began to fly. The app made the cover animated in such a realistic way. I would have found it so cool if they would have had Luce's head turn around but, unfortunately, I wasn't that lucky. I found this to be such a cool addition to this book, that I now feel the need to inspect all of my books for this cool feature :P LOVE THE COVER!
" "Yes, our very own Valentine's tradition," he mused. Peonies and...well, there ought to be something else. Oughtn't there?" "Peonies and"-Luce racked her brain. She didn't need anything else. Ddin't need anything but Daniel...and,well..."How about peonies and a kiss?" "That's a very, very good idea."